As always, a great tutorial with super photos and nice descriptions. I love this!! I have a question for you. Do you use a ruffler foot or a regular foot when you make the ruffles? Love the scarf. I bet it is the most cozy warm with are the criteria for a favorite scarf. Oh yes and who is the darling model? the model is my good friend's daughter. no ruffle foot involved...i just made tension up on the top thread by holding the spool on top a little. it creates the ruffles as you go. off to buy flannel now for a last-minute christmas pressie! Not only are the scarf and the model soooo very cute, your pics look like a GAP ad! Great job! I am SO making one of these today. I love this!! Way to go girlie. LOOK AT YOU clever little lady!!! I want one! I will definitely be making one of these very very soon! and maybe a little matching one for my daughter. :) SO clever and classy! I LOVE this! I'm going to post a link to this tutorial on my blog tomorrow, December 22! sewwhattoday.blogspot.com! I'm so happy to find your blog, you've made some darling things! gap ad, indeed! This scarf is AMAZING! Why why why, do you keep making things that I want to make when I already have a list a mile long! You crafty little devil. PS - I have my itinerary for UT. Let's chat. i absoluely LOVE this v, it's fantastic. just what i needed for one more giftie to make. cheers to you! LOVE the scarf tutorial!!! I HAVE to make this for my super cool niece!! Sorry to ask, but did you prewash the flannel? What a great tutorial Vanessa!! Thank you! I'm still in love with all your photos. Absolutely stunning. Magazine worthy! Ok, I must know where the model got her sweater dress and the fuzzy hooded coat. Love them both. LOVE the scarf. Will be making one soon. When I find the time!! Oh. My goodness. I would have voted for this if the theme had been "toilet paper" because it's that beautiful. Great job!! 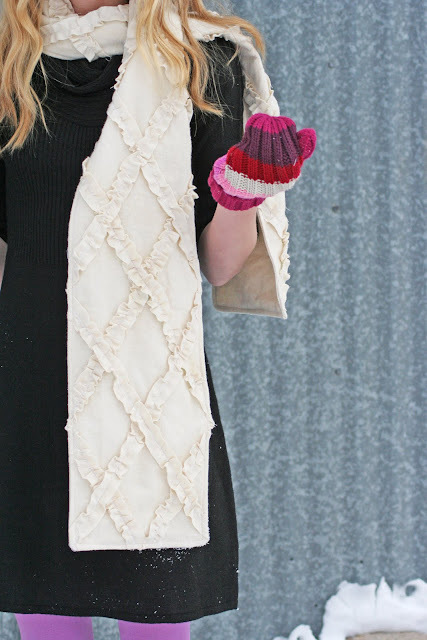 Darling scarf and darling girl! I can't tell you how much I loved making this. It was such fun! I made it in a bright orange and I love it! Thanks for sharing your creative ideas with all of us. And you completely saved my on the ruffling technique. It was so quick and my ruffles were all relatively even. Thanks! I made one last night in black and love it! I think I'm going to use this idea to make a skirt for my little girl with the rest of my flannel. Yay for ruffles! Congrats on the win but I'm so bummed! I've been out of town an unable to check the blogs I follow. . . so I missed getting your tutorial! Bummer. But, congrats anyway! I love this scarf what a fashion statement. Where can I get pattern?